Visit the three roman columns hidden away behind a building on calle Marmoles in Santa Cruz. You may even catch a glimpse of the cat family living there. Just like in Rome! There were more columns at one point, but some were taken to the Alameda and are now propping up statues at either end of the Plaza. This was a temple dedicated to Hercules. The street (Marmoles, or marble) comes from the location of the columns. The Alameda de Hercules takes it's name from the original site of the temple. Take a stroll to the Macarena church, cross the street, follow Calle Don Fadrique and then Sanchez Pizjuan until you reach La Venta los Gatos. This used to be the countryside and this particular watering hole was where the poet Becquer wrote much of one of his works. It is now used for special events, but not open to the public. 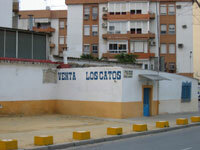 The venta is now surrounded by apartment buildings when the area was developed in the 1970's. Visit the ruins of the Castillo de San Jorge under the Triana Market, just on the other side of the bridge from the center. Living quarters, part of an old cemetery and a connection with the Spanish Inquisition are all part of the site. This is part of the Museum of Tolerance which is interesting, but the Plaza Encarnacion museum is (in my opinion) much better! You can get a good view inside at the end of the market opposite the bridge. You've likely seen the Golden Tower, or the Torre del Oro, perched along the Guadalquivir river. So why not check out it's neglected cousin just down the street, the Torre de la Plata, or Silver Tower, which can be found on calle Santander. While you can't go in you can get a good view of it from calle Temprado, just down from the Hospital de la Caridad which is also a popular sight to visit. During Semana Santa take a taste of torrijas, a dish close to french toast, made with thick bread, white wine, eggs and honey. There's enough sugar in them to keep you on your feet and moving for the next procession. They show up just about everywhere during Holy Week, but nobody makes them better than my suegra! And the process is a fairly complicated and long one, so enjoy the eating and leave the preparation to someone with experience! 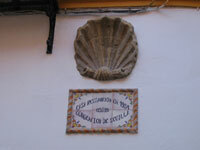 Find the geographic center of Seville on calle Jose Gestoso marked by what looks like a shell in the building. Keep in mind this was the geographical center a long time ago! Still, it puts you in the center of the old city, or casco antiguo, of Seville. Seville is said to have the largest old city center of any city in Europe, and you can spend hours and hours getting lost in it if you choose to do so. Take a tour of the El Salvador church now that it is finished.. The church was closed for about 5 years after a stone fell out of the ceiling. During the works they discovered the ruins of the original, main mosque of Seville as well as tombs from Christian times. The church would be considered a Cathedral in many other cities and the restoration work is impressive. One hint: buy your ticket at the Cathedral first, which gives you free entrance to El Salvador. Otherwise you have to pay 3 Euros. Enjoy the Hammam experience in some of the nicest Baños Arabes, or Arab baths in all of Spain. 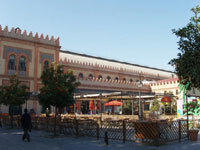 The complex, called Aire de Sevilla, just opened in Santa Cruz and are hidden away on calle Aire. They have just about everything, from different temperature baths to massages, steam rooms, a teteria and a roof top terrace with a very nice view of the Cathedral. This was the site of some small Arab baths many centuries ago. You can find more information on the baños arabes at: www.airedesevilla.com. Find out the way the eat tapas, or pintxos, up north and have your evening meal at Lizarran. Ok, so it's a chain restaurant, but it's still a lot of fun. Plus it takes all the guess work out of ordering your food. Simply order a beer and ask for a plate. Then take your choice of a number of cold tapas on toothpicks along the bar. Or wait until the waiter comes around to your table with the hot tapas. When all is done don't throw away the toothpicks - they need them to calculate your final bill! Visit La Fabrica de Cerveza, in Plaza de Armas. If you've grown tired of Cruzcampo and Heineken in a bottle as your choices you can se what's on tap in Seville's only brew pub. There is also plenty of outdoor seating. If you feel like a hamburger after your beer head to Foster's Hollywood upstairs, the only restaurant which gives you free refills on Coke, or I guess make that Pepsi now.